Dundee is one of the most enchanting Scottish cities to spend time in. Set on the banks of the river Tay, attractive and historic Dundee is Scotland’s fourth city, offering visitors a host of attractions as well as easy access to some of Scotland’s highland scenery. 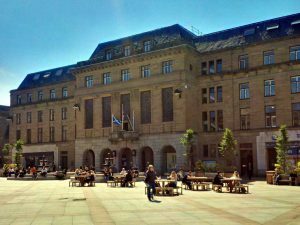 The range of attractions in Dundee is truly diverse with historic buildings, museums, galleries and even old ships all competing for the visitors’ attention. Of note is the award-winning Discovery Point, which houses the Royal Research Discovery ship which took Captain Robert Scott to the Antarctic in 1901. The McManus Galleries with 10 separate galleries and impressive collections of Victorian art are also worth a visit. In the city center, the Old Steeple, the highest surviving medieval tower in Scotland is a great place to take in views of the Tay, and orientate yourself to the city. Nearby, the City Quay offers a mixture of shopping and leisure activities in a stunning waterfront location. Shopping options in the city abound, and the pedestrianized High Street connects the modern, glass fronted Overgate Center to the Murraygate and Wellgate shopping centers, with department stores and shops suitable for all tastes. The city also boasts a mixture of traditional and contemporary eating places as well as a huge number of bars and clubs. Then there is cinema and theater to choose from, and with over 50 parks, there are plenty of peaceful venues to escape the streets and relax. Of the many rewarding day trips just a short drive away, a good starting point is the Dundee Law, an extinct 571 ft. volcano that dominates the city skyline. Alternatively, why not practice your swing on the championship Campdown and Caird Park golf courses? For nature lovers, there is the rugged Angus coastline with its award-winning beaches, or inland the many glens and mountains that offer outstanding hiking.